High purity Iodine in crystal form (atomic number 53). Ideal for element collectors or those conducting experiments with pure Iodine. 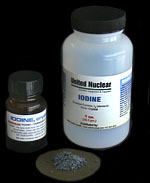 Iodine is primarily used for water purification and as a disinfectant. On heating, Iodine sublimes directly from a solid to a dense violet vapor. NOTE: Federal regulations limit purchase of this chemical to 1 ounce per year per customer. Caution: Iodine and its vapors are toxic and corrosive. User must use proper safety precautions (wear a filter mask/respirator and gloves, etc.) when working with this material.